DETROIT (AP) - A California man accused of threatening to blow up a popular Detroit-area mosque has had several violent, unpredictable run-ins with the law dating back to the 1970s, including one in which he kidnapped his son from a foster home and crashed a plane while trying to get away. Roger Stockham, 63, has twice been committed for psychiatric treatment by the courts, and his attorney, Mark Haidar, told The Associated Press on Tuesday that after meeting with Stockham earlier in the day, he came away worried about his client's mental state. "He indicated he never meant to hurt anyone at any time and had no intention of blowing up any mosque at any time," Haidar said of Stockham, who has been living in Imperial Beach, Calif.
Stockham was arrested during a Jan. 24 traffic stop near the Islamic Center of America in Dearborn, which is one of the nation's largest mosques and serves the area's huge Arab community. Police kept quiet about Stockham's arrest for a week after consulting with Islamic leaders who were worried about possible copycat attempts. Hours before his arrest, witnesses say Stockham sipped Scotch at a nearby sports bar and bragged about how he was going to cause a big explosion. Police say when the pulled him over, he was wearing a ski mask and had more than two dozen Class-C fireworks in his car, including M-80s, which are illegal in the state. Haidar said he hasn't reviewed the evidence, but based on Stockham's history of mental illness he will request a competency evaluation for him during Friday's scheduled preliminary examination in Dearborn's district court. Police have not discussed why they believe Stockham may have targeted the Dearborn mosque. Joe Nahhas, a manager at the Detroit bar Stockham allegedly visited before his arrest, said Stockham claimed to have become a Muslim after returning from the Vietnam War, and said he recognized that Stockham could speak at least some Arabic. He also said Stockham claimed to be part of a group of Indonesian mujahedeen, or holy warriors. The fireworks, as described by police, could not have destroyed a building, but they could have been used to wound or kill people, said John V. Goodpaster, an explosives expert and assistant professor at Indiana University-Purdue University Indianapolis. Federal authorities said that was not the case in June 1985, when they said Stockham planted a bomb in a Reno, Nev., airport garbage can, then called the Reno Gazette-Journal and the FBI to tell them about it. The airport was evacuated and the device was disarmed, but bomb experts said that it could have killed anyone in the vicinity had it exploded. Stockham was convicted of one count each of attempting to damage a building used in interstate commerce and possessing an unregistered firearm, and was sentenced to 10 years in prison for each count, with the counts to run concurrently. It was not immediately clear when and under what terms Stockham was released. Stockham's first serious brush with the law occurred in 1977, when according to a 1985 report in the Los Angeles Times, he held a psychiatrist hostage in a Century City office building using two bombs and a pistol. After more than four hours, he released the psychiatrist unharmed and surrendered to police, the paper reported. In August 1979, after undergoing treatment for mental illness, Stockham abducted his 9-year-old son from a foster home and took off in a rented Cessna airplane. Los Angeles Sheriff's deputies told the AP at the time that Stockham radioed the control tower and said he had a bomb, a gun and a boy and wanted to land his plane and transfer to a larger aircraft to leave the country. He only touched down briefly at the airport and then took off. He crashed the plane about two miles away and was found hiding in nearby bushes with his son. Neither was injured, though subsequent AP reports said Stockham had a rifle. A woman named Kathy called two local radio stations at the time, claiming to be Stockham's wife, and said her husband was a Muslim and planned to take his son from a previous marriage to Iran after hijacking a plane. The woman said her husband was seeing a psychotherapist. 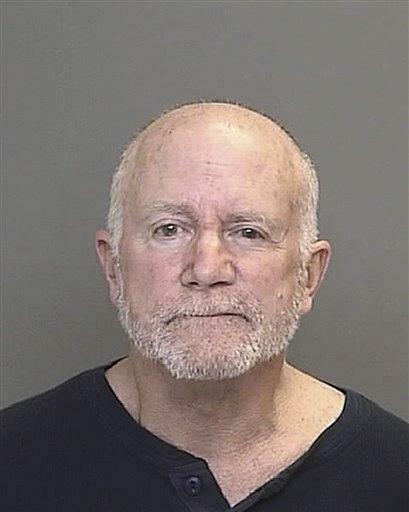 While Stockman was out on bail awaiting trial on charges that he abducted his son, prosecutors said he set fire to several Union Oil Co. storage facilities in Lompoc, Calif. Stockham was convicted of kidnapping, but during his arson trial, he was found legally insane and sent to Patton State Hospital, from where he escaped in October 1981 and eluded capture for four months before surrendering. In 1982, he was released and put on probation for three years, which included receiving out-patient therapy at the state hospital. Court documents in Vermont show Stockham pleaded not guilty by reason of insanity to charges stemming from threats made in 2002 against then-U.S. president George W. Bush and against officials at veterans' facilities in that state. A 2002 story from The Burlington (Vt.) Free Press said he called the newspaper twice in one day that October and said he was going to set off bombs in the neighborhood. He called again the next day and said he was "a local Muslim terrorist on a roll." He said he was diagnosed with post-traumatic stress disorder from his time in Vietnam, and that he was taking medication for manic-depression. The same day he was arrested on a federal warrant on charges of making the threats. Stockham was released in 2005 from the U.S. Medical Center for Federal Prisoners on several conditions, including that he refrain from drinking alcohol and continue psychiatric treatment. The warden of the Springfield, Mo., facility said Stockham had recovered sufficiently enough from his mental illness that he wouldn't pose a danger to the public if he adhered to the conditions of his release. Nahhas, the Detroit bar manager, said he called 911 to report the threats Stockham allegedly made, and police have said a tip by a local business leader preceded Stockham's arrest a few hours later. Neighbors of Stockham in Imperial Beach described him as someone who was pleasant but troubled, and who stuck to himself. They said he frequented the local VFW bar. In a page pulled from the website of VFW Post 5477 in Imperial Beach, a profile purportedly posted by Stockham said he joined the post in September 2009, and included a photo of a man who closely resembles Stockham. It says he joined the Army in 1965, "went to Nam march of 68," and "saw a lot of action, got a lot of air medals, but not much else." It said after a seven-year stint in the Army, he "spent a couple of years flying as a commercial bush pilot in Indonesia." It ends with "two beautiful kids, one granddaughter." Haidar wouldn't comment on Stockham's claims, including those related to Islam, but suggested his client "just had some confusing thoughts." "I don't know that he intended to do anything, other than he's got this mental history," Haidar said. "Maybe he just does things that he doesn't realize he's doing." Watson reported from San Diego. John Curran in Montpelier, Vt., contributed to this report.